Two to go! 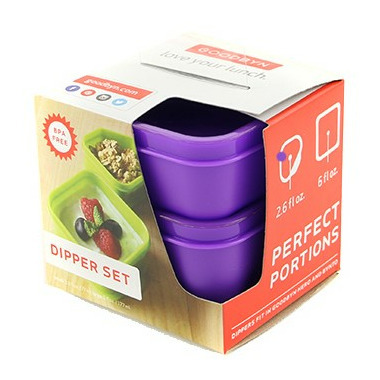 Goodbyn Dipper Set is perfectly sized for a yogurt, small sides, or dips. Designed to offer more compartments when you need them in both Hero and Bynto. Versatility wins. 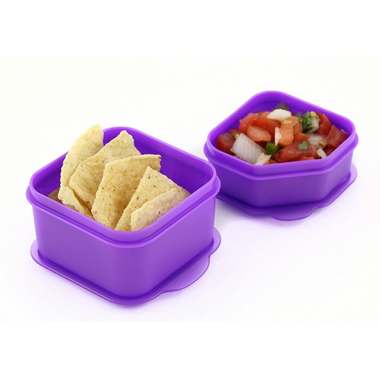 These are nice, hold their shape in the dishwasher, I wouldn't put liquid like yogurt or salsa in them as it does leak through, but for a small snack or fruit, it works. I bought Goodbyn Hero boxes 2 years ago for my 2 kindergardeners. It has totally held up through 2 years of school for them each and will last for more I'm sure. I needed to buy replacement containers as the little containers go missing. The seals on these are excellent. They're a little difficult for my 4yo to open, so she gets her teacher to help, but at least they NEVER bust open and spill. We love them. Bright colours are easy to identify. Dishwasher safe. Love them.